PT Saptaindra Sejati - SIS or known as "Saptaindra Sejati" is a well-established and reputable company in Indonesia, running in coal mining industry. SIS operates primarily as a mining and hauling contractors. SIS provides an integrated mining services, contract mining, civil works and infrastructure development, as well as logistical support to leading mining companies in Indonesia with international standard. PT Saptaindra Sejati is a mining services subsidiary company of PT Adaro Energy Tbk (ADARO Group), one of the largest public-listed mining groups in Indonesia. At present, PT Adaro Energy Tbk holds 100% ownership of Saptaindra Sejati’s shares. 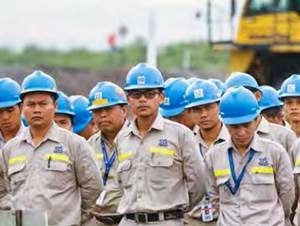 According to PT Adaro Energy Tbk Annual Report 2016 as cited by JobsCDC,com, SIS has more than 1,300 units of heavy equipment and directly employs 6,836 employees (as of December 2016). Bachelor degree (S1) from reputable university majoring in Statistic with minimum GPA of 3.25. Required experience for more than 2 years in multi variance data management and analysis. Strong computer skill, preferable competent in using statistical software such as Minitab, SPSS, SAS, Matlab. Demonstrated good communication, strong reporting. Have a good technical writing and presentation skills. Good understanding of equipment/vehicle maintenance process. Strong analytical and conceptual thinking. Bachelor degree (S1) from reputable university majoring in Information Technology with minimum GPA of 3.25. Required experience for more than 1 year in IOT and system development. Good knowledge of database, system design, server and IT Infrastructure. Good understanding of electrical system in heavy equipment. Bachelor degree (S1) from reputable university majoring in Mechanical Engineering with minimum GPA of 3.25. Required experience for more than 2 yeasr in heavy equipment maintenance in mining industry. Strong understanding in lubricating system, fuel system and mechanical system. Strong reporting, diligent and good technical writing skills. JobsCDC.com now available on android device. Download now on Google Play here. Please be aware of recruitment fraud. The entire stage of this selection process is free of charge. PT Saptaindra Sejati - Data Scientist, Data System Scientist, Equipment Engineer SIS March 2018 will never ask for fees or upfront payments for any purposes during the recruitment process such as transportation and accommodation.